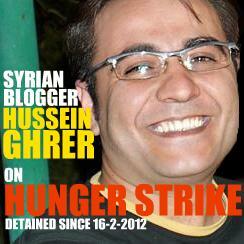 We received information that Syrian blogger Hussein Greer began a hunger strike to protest his continued incarceration after spending more than five months in detention cells as of the date of this statement. We, Syrian and Arab bloggers as well as bloggers in solidarity with Hussein and his case, demand the immediate and unconditional release of our colleague in detention, blogger and friend Hussein Ghrer especially since more than four months had passed without pressing charges against. His four-month long detention far exceeds the maximum legal limits for incarceration without court referral which is set to 60-days according to Syrian law.